It was a very warm day last Wednesday so we started out at 4.30 rather than 4. I decided that we should ride through the forest as of course there's plenty of shade. We had an unexpected turnout as a couple of holiday visitors joined us! We arrived at the beginning of the forest trail. 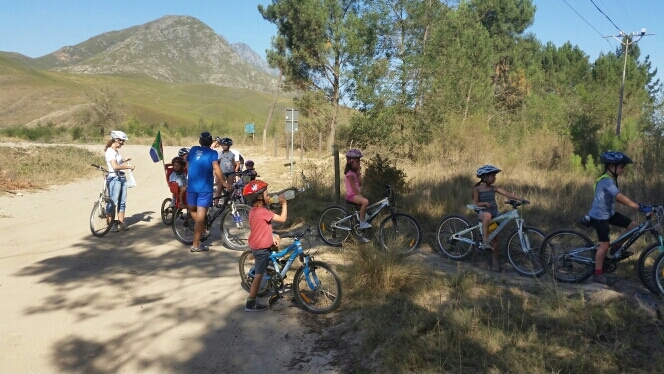 Every Wednesday, now at 4.30, we have a Greyton Kids riding session. I try to incorporate a skill or two during the session. The kids have fun and it gives them a dedicated opportunity to ride their bikes. A great break from school work!